NextBus uses Global Positioning System (GPS) tracking satellites to provide vehicle arrival information and real-time maps— not just bus schedules — to passengers. 1. 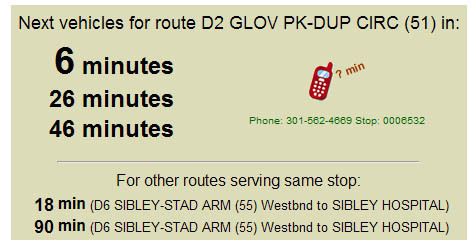 Go here and choose your busline. 3. Select the next stop on the route to show destinations for all vehicles. The nextbus link seems to be dead on your header. I tried to use it today to predict when my bus would come during today’s snow but it didn’t work, any reason why? Hopefully they’ll have it back online soon. read here for more about the ongoing struggle to get nextbus up and running for all of us. GM, I think you need to get rid of this tag. The metro Next Bus system is a ghost, a fantasy, an apparition, a mirage, a fools paradise, an illusion, a fabrication. A big joke brought to you by WMATA.